U.S. birth rates declined last year for women in their teens, 20s and — surprisingly — their 30s, leading to the fewest babies in 30 years, according to a government report released Thursday. NEW YORK (AP) — U.S. birth rates declined last year for women in their teens, 20s and — surprisingly — their 30s, leading to the fewest babies in 30 years, according to a government report released Thursday. Experts said several factors may be combining to drive the declines, including shifting attitudes about motherhood and changing immigration patterns. 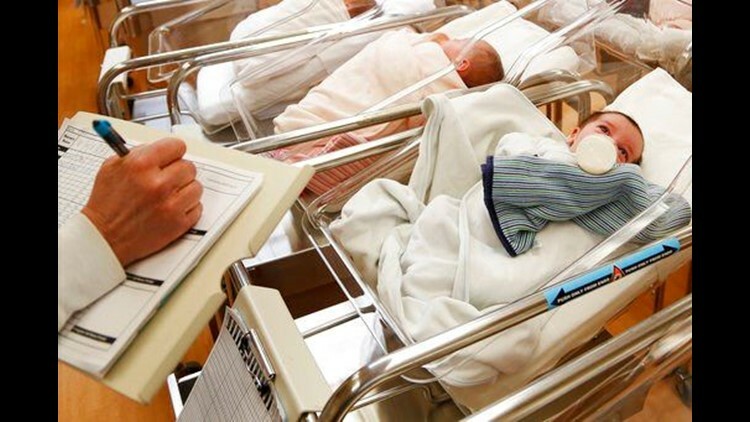 The provisional report, based on a review of more than 99 percent of the birth certificates filed nationwide, counted 3.853 million births last year. That's the lowest tally since 1987. Births have been declining since 2014, but 2017 saw the greatest year-to-year drop — about 92,000 less than the previous year. That was surprising, because baby booms often parallel economic booms, and last year was a period of low unemployment and a growing economy. But other factors are likely at play, experts said. One may be shifting attitudes about motherhood among millennials, who are in their prime child-bearing years right now. They may be more inclined to put off child-bearing or have fewer children, researchers said. Another may be changes in the immigrant population, who generate nearly a quarter of the babies born in the U.S. each year. For example, Asians are making up a larger proportion of immigrants, and they have typically had fewer children than other immigrant groups. —The rate of births to women ages 15 to 44, known as the general fertility rate, sank to a record low of about 60 per 1,000. —Women in their early 40s were the only group with higher birth rates in 2017, up 2 percent from the year. The rate has been rising since the early 1980s. —The cesarean section rate rose by a tiny amount after having decreased four years. Studies have shown C-sections are more common in first-time births involving older moms. —Rates of preterm and low birth weight babies rose for the third straight year, possibly for the same reason. —Birth rates for teens continued to nosedive, as they have since the early 1990s. In 2017, they dropped 7 percent from the year before. —Rates for women in their 20s continued to fall and hit record lows. They fell 4 percent. —Perhaps most surprising, birth rates for women in their 30s fell slightly, dipping 2 percent for women ages 30 to 34 and 1 percent for women 35 to 39. Birth rates for women in their 30s had been rising steadily to the highest levels in at least half a century, and women in their early 30s recently became the age group that has the most babies. That decline caused some experts' eyebrows to shoot up, but they also noted the dip was very small. "It's difficult to say yet whether it marks a fundamental change or it's just a blip," said Hans-Peter Kohler, a University of Pennsylvania demographer who studies birth trends. Another notable finding: The current generation is getting further away from having enough children to replace itself. The U.S. once was among a handful of developed countries with a fertility rate that ensured each generation had enough children to replace it. The rate in the U.S. now stands less than the standard benchmark for replacement. It's still above countries such as Spain, Greece, Japan and Italy, but the gap appears to be closing. A decade ago, the estimated rate was 2.1 kids per U.S. woman. In 2017, it fell below 1.8, hitting its lowest level since 1978. "That's a pretty remarkable decline," said Dr. John Santelli, a Columbia University professor of population and family health and pediatrics.